Crystal clear polystyrene containers for metallic glitters and confetti. Crystal clear polystyrene containers are ideal for packaging metallic glitters and confetti. 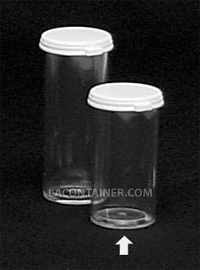 These containers have a straight wall that is great for applying clear stickers or foil labels. This polystyrene container has a high gloss finish and is capped with a white polyethylene snap-cap which is easy to open and not child resistant. 24.9mm Dia. X 52.4mm Ht. 1.0" Dia. X 2 1/16" Ht.